Just wanted to send in a photo of my finished Julius Pettersson knife in the hope that you will add it to the others already on your blog page. 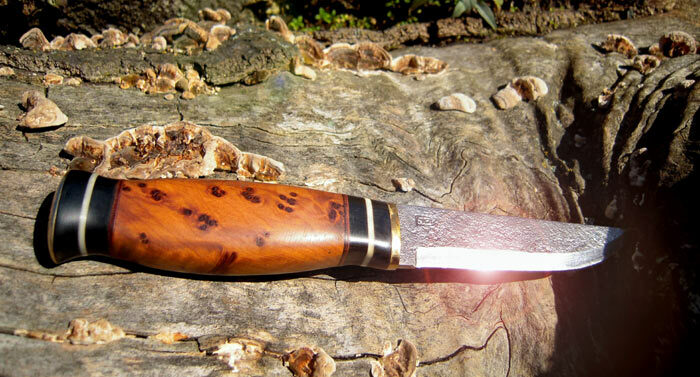 The handle is Thoya Burr and buffalo horn inlayed with bone. The ferrule and tang are both brass for added strength. Working on these wonderful blades is such a relaxing and rewarding undertaking as you are building something that will be a source of pride every time you use it… and it will last a lifetime! Many thanks for all you do in sourcing quality items such as these blades!….. now I better get on with building my crooked knife! This entry was posted in Bushcraft Clothing & Equipment, Customer Posts on March 10, 2011 by Woodlore Team. for ideas for a knife handle. A very beatiful handle, Nick. I finished my crook knife handle (you can see it a few entries before yours) and I would really recommend you to give it a try, especially after demonstrating what you are able to create from these blades! I am also very happy with the quality of my crook knife blade.